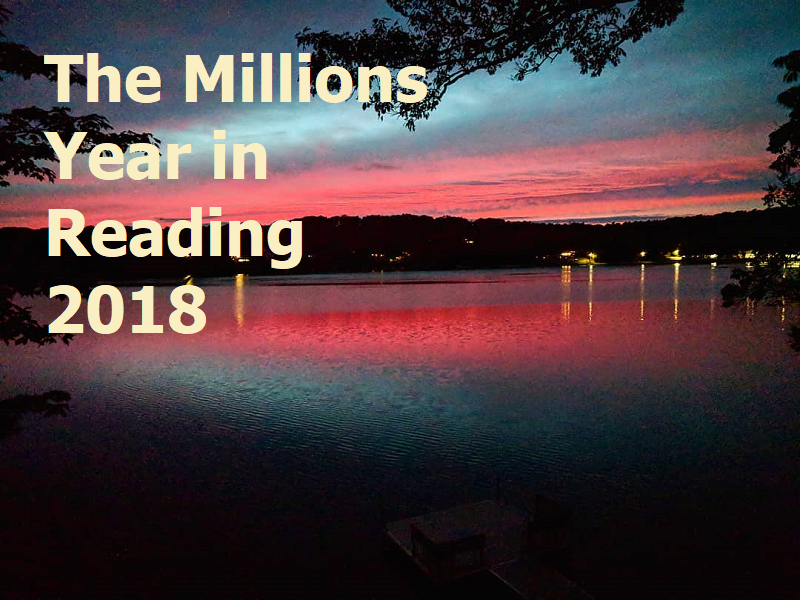 This is the 14th year that the Year in Reading series has run at The Millions. It’s the third year that I’ve blearily written the introduction to kick off the series the night before it’s set to begin, and I’m running out of ways to say it: this is the best thing we do here at the site. There are so many things competing for our attention, and most of them are bad. So at a time of year when people are recovering from family drama or girding their loins for more, when election results are being processed or contested, when writers are licking their wounds or thanking their stars about the year-end lists, Year in Reading feels like a place for enthusiasts to gather and compare notes about the things that brought meaning to life as we hurtle into the future. 2018 was the year of solastalgia; Year in Reading is a place of solace. The series is a record of love and this year, as ever, I am grateful for it. The names of our 2018 contributors will be unveiled throughout the month as entries are published (starting with our traditional opener from Languagehat’s Stephen Dodson later this morning). Bookmark this post, load up the main page, subscribe to our RSS feed, or follow us on Facebook or Twitter to make sure you don’t miss an entry — we’ll run at least three per day. Ling Ma, author of Severance. Bryan Washington, author of Lot. Elizabeth McCracken, author of Bowlaway. Shobha Rao, author of Girls Burn Brighter. Brandon Hobson, author of Where the Dead Sit Talking. Ada Limón, author of Bright Dead Things. Kaitlyn Greenidge, author of We Love You, Charlie Freeman. M.C. Mah is a writer in Brooklyn. Samantha Hunt, author of Mr. Splitfoot. Crystal Hana Kim, author of If You Leave Me. Colin Winnette, author of The Job of the Wasp. Laila Lalami, author of The Other Americans. Brian Phillips, author of Impossible Owls. Lauren Wilkinson, author of American Spy. Jianan Qian, The Millions staff writer and author of Say No to Eggs. Hannah Gersen, The Millions staff writer and author of Home Field. Il’ja Rákoš, The Millions staff writer. Edan Lepucki, The Millions staff writer and author of Woman No. 17. Marie Myung-Ok Lee, The Millions staff writer. Nick Moran, The Millions special projects editor. Jordy Rosenberg, author of Confessions of the Fox. Angela Garbes, author of Like a Mother. Neel Patel, author of If You See Me, Don’t Say Hi. Hernán Diaz, author of In the Distance. Adrienne Celt, author of Invitation to a Bonfire. Donald Quist, author of For Other Ghosts. Lisa Halliday, author of Asymmetry. Ayşegül Savaş, author of Walking on the Ceiling. Octavio Solis, author of Retablos: Stories From a Life Lived Along the Border. Namwali Serpell, author of The Old Drift. Chelsey Johnson, author of Stray City. Daniel Torday, author of The Last Flight of Poxl West. May-lee Chai, author of Useful Phrases for Immigrants. Casey Gerald, author of There Will Be No Miracles Here. Etaf Rum, author of A Woman Is No Man. Lucy Tan, author of What We Were Promised. Lisa Brennan-Jobs, author of Small Fry. Garth Risk Hallberg, The Millions contributing editor and author of City on Fire. Carolyn Quimby, The Millions associate editor. Thomas Beckwith, The Millions staff writer. Sonya Chung, The Millions contributing editor and author of The Loved Ones. Lydia Kiesling, The Millions editor and author of The Golden State. Adam O’Fallon Price, The Millions staff writer and author of The Grand Tour. Jacqueline Krass, The Millions intern. Pitchaya Sudbanthad, author of Bangkok Wakes to Rain. Margaret Wilkerson Sexton, author of A Kind of Freedom. Steph Opitz, founding director of the Loft’s Wordplay. Katie Kitamura, author of A Separation. Ingrid Rojas Contreras, author of Fruit of the Drunken Tree. Hisham Matar, author of The Return. Anna Wiener, a writer in San Francisco. Dave Cullen, author of Parkland. Jen Gann, editor, New York Magazine. Tommy Orange, author of There There. Anisse Gross, a writer in San Francisco. Tara Marsden, co-founding editor of Wolfman New Life Quarterly. Chaya Bhuvaneswar, author of White Dancing Elephants. Emma Hager, a writer in California. Chris Power, author of Mothers. Nana Kwame Adjei-Brenyah, author of Friday Black. Rachel Khong, author of Goodbye, Vitamin. Kamil Ahsan, reviews editor at Barrelhouse. Marta Bausells, a writer and journalist in London. Anne Yoder, The Millions staff writer. Michael Bourne, The Millions staff writer. Ismail Muhammad, The Millions staff writer and reviews editor at The Believer. Matt Seidel, The Millions staff writer. Ed Simon, The Millions staff writer. Kaulie Lewis, The Millions staff writer. Emily St. John Mandel, The Millions staff writer and author of Station Eleven. Nick Ripatrazone, The Millions contributing editor and author of Ember Days. Kirstin Butler, The Millions social media editor. Out this week: All You Can Ever Know by Nicole Chung; Things to Make and Break by May-Lan Tan; Gone So Long by Andre Dubus III; Impossible Owls by Brian Phillips; Scribe by Alyson Hagy; A Dream Called Home by Reyna Grande; What If This Were Enough? by Heather Havrilesky; and Good and Mad by Rebecca Traister. We wouldn’t dream of abandoning our vast semi–annual Most Anticipated Book Previews, but we thought a monthly reminder would be helpful (and give us a chance to note titles we missed the first time around). Here’s what we’re looking out for this month. Find more October titles at our Great Second-Half Preview, and let us know what you’re looking forward to in the comments!